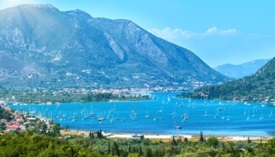 Nydri is the main island resort for tourists on Lefkada. It is set at the mouth of an inlet from Vlycho Bay and has an amazing view of many small islands that are scattered around the area. This popular destination boasts a great variety of options for eating and drinking, as well as boat excursions and water sports. The main beach is very popular during the summer, but for those looking for something a little bigger and not so full, there are other beaches a short distance away on the west coast of the island. The surrounding area is mostly flat, so travelers looking for an adventure can take a nice bike ride or walk through the olive groves to see the Nydri Waterfalls and the wild flowers that appear in the spring.